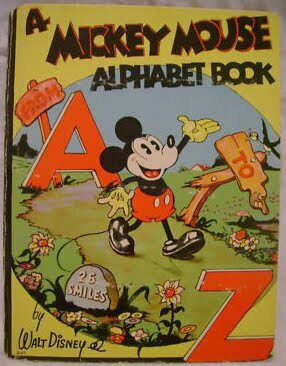 The earliest Disney alphabet book that I've come across is the hardcover A Mickey Mouse Alphabet Book (From A To Z) published by Whitman in 1936. A British edition by Collins features the identical cover illustration but is titled as A Mickey Mouse Story (From A To Z). A.B.C de Mickey, a French Disney alphabet book published by Hachette in 1936 features a cover illustration clearly redrawn from these English-language Disney alphabet books: However, the contents of the French and the English-language books are not identical, with different sets of illustrations. 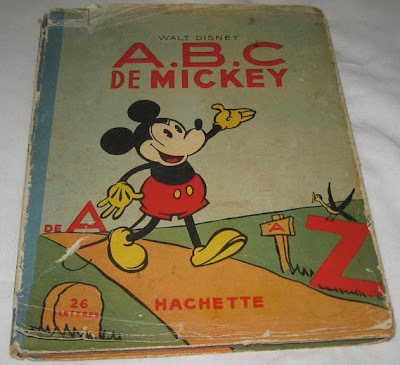 The French book also boasts a color illustration on the reverse of its cover: In the US, Whitman also published the soft-cover A Mickey Mouse Alphabet in 1938.